a PADI Gold Palm IDC resort. Bungalows and all rooms come with hot water, western toilet and 24 hour electricity. There are wooden, double bed bungalows with own terrace and family bungalows with two connecting double bed rooms. Our beautiful laid out, cleanliness resort make the ideal choice for those couples & families. All rooms are directly behind the beach & short walk away. Resot is located on the hill, bungalows are in a lush environment with Thai style & modern comforts. A boutique resort, all rooms enjoy seaview with private balcony. We offer an accomodation suitable for every budget. Llittle resort is hidden in a private bay. You will have a breathtaking view from every bungalows. We offer fantastic and charming rooms, 15 modern Thai style guesthouses and 15 tropical style accommodation guesthouses which are closer to the sea. All boat to Koh Tao arrive in Mae Haad. Our bungalow is loacted just 2 mins walk from the pier and the town. Beachfront luxury apartments are conviently located 200 meters of south of mae haad pier. Our bungalows are about 30-100 meters away from the beach. Relax in nice rooms located in green garden and enjoy activities on the beach. A very private atmosphere with wooden style bungalows directly at the beach and in a tropical garden. All rooms are fitted with teak furnishing. Air-con and ceiling fan, hot water shower, mini bar, satellite TV & free WiFi. Offers a Classic wooden budget bungalows in a tropical garden with large balcony and unobstructed sea and sunset view. Koh Tao Diving with Blue Diamond Scuba Diving Vacation & Scuba Diving Lessons, PADI qualified. Offers family houses, romantic suites and beach bungalows. All accommodation is close to the beach. Beach front of our bungalows have excellent underwater sight. You can dive or snorkeling in crystal clear water, enjoy with many fishes and beautiful corals. 5 bunggalows with air-con, 4 bungalows with fan provided with all the comfort & services you can need to have a plesant and unforgettable stay. All rooms has en suite bathrooms and furnished for your confort. All rooms look out over the bay with spacious balconies and stunning sea view. Resort has both budget fan & air-connditioned bungalows available. 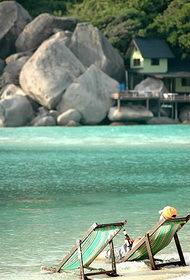 Our resort is one of the first class resorts on Koh Tao. Also, offers a PADI diving courses. Our boutique villas and pool are built on a hillside, surrounded by a lush tropical garden, impressive granite boulders, and jungle and coconut trees. Offers 16 well appointed rooms. All cozy residences are provided a range of superior amenities for a completely comfort and relaxing stay.e. The resort is featured with 25 fine design rooms. Each guest room is uniquely designed and decorated with attention to all details to fulfill your simple life. 11 luxury bungalows, each cottage is situated to enjoy a unique view of the sunset and sea and to enjoy privacy and serenity. Offers 26 private luxury villas and 5 cottages for the budget travellers. The restaurant is just a short distance down the beach. Luxury, special and unlike anywhere else on earth. Made of beautiful sculptured wood and decorated with elaborate art from around the world. Privvate bungalows ranges in comfort from standard to deluxe, a spacious sleeping area and living space, and private terrace facing the sea. Located on its nothern tip. The architecture of expansive teakwood 48 villas was inspired by the charming dwellings in a rural village. Each apartment comes with its own unique theme with no two rooms being furnished in the same manner. Benefits of 3 swimming pools services the differnet needs. Koh Tao, little more than 21 km², is located about 70 km east of the coastline between Suratthani and Chumphon, in the Gulf of Thailand. Koh Tao means Turtle Island, because in the past the waters in the area had been rich with sea turtles, nowadays they have mostly moved on to other breeding grounds. On June 18, 1899, His Majesty the King Chulalongkorn (Rama V 1868-1910) visited Koh Tao and left as evidence his monogram on a huge boulder at Jor Por Ror Bay next to Sairee Beach. This place is worshipped even today and should be treated with respect. From 1933 on the island was used as a political prison. In 1947, Khun A-Paiwong, prime minister at the time, pleaded and received a royal pardon for all prisoners on the island. Everybody was taken to the Suratthani shore and the "Turtle" was abandoned again. But not for long. In the same year Khun Ueam and his twin brother Khun Oh reached Koh Tao from the neighboring Koh Phangan by trying out their traditional sail boat, for that time a quite long and dangerous journey. Even though the island was still under royal patronage, it didn’t stop these pioneers claiming themselves a good piece of land on today's Sairee Beach. Having brought their families over, they began to cultivate and harvest the excellent soil. The first generation of today's community had settled! They lived a very simple and tough life harvesting coconuts, fishing and growing vegetables, which were also traded with Koh Phangan. Despite the difficulties in reaching the island, the population then grew steadily. In the eighties the first travelers discovered the island paradise and their special "backpacker-network" quickly made it widely known and a popular destination. As a consequence, bigger, faster and safer boats were used to allow easier access to Koh Tao. During the past ten years the reputation of Turtle Island's natural beauty, especially its marine life and coral reefs, spread the world over and the number of paradise seekers increased rapidly. It soon became one of the major dive sites in Thailand, attracting beginners and professionals alike. The local businesses expanded immediately to catch up with the needs of the new clientele. The island today, though still remaining an absolute paradise, caters for all tastes and budgets. If you are interested in more historical details and stories about the Turtle, go to visit Khun Orawan at Seashell Resort, Sairee. She is the great-grand daughter of Khun Ueam and will be more than glad to give you further information. - Hat Cho Po Ro or Hat Sai Ri – This small powdery beach provides accommodation. The Giant Clam Park nearby breeds the near-extinct giant clam and exhibits many aquatic animals. It is open daily. - Koh Nang Yuan - A coral island with a high viewpoint and long white sandy beaches. - Kong Hin Khao and Kong Hin Khiao – These overlaying rocks have submarine alcoves, whereby many fish frequent. - Kong Hin Chumphon – Many fish frequent this area on the northwestern part of the island. During breeding season in March – April, this area is closed from any fishing activities. - Ban Mae Hat – Pier, transportation terminal, diving schools and shops renting diving gear, concentrate in this economic centre of the island. - Kong Sai Daeng – Rarely seen black-eared shark frequent the red sandstone by the mouth of Thian Nok Bay. 1. All and sundry would like to see the viewpoint on Koh Nganyuan. 3. All and sundry would like to dive around Koh Nangyuan, which is the great place for coral view. The best period is from December to April. 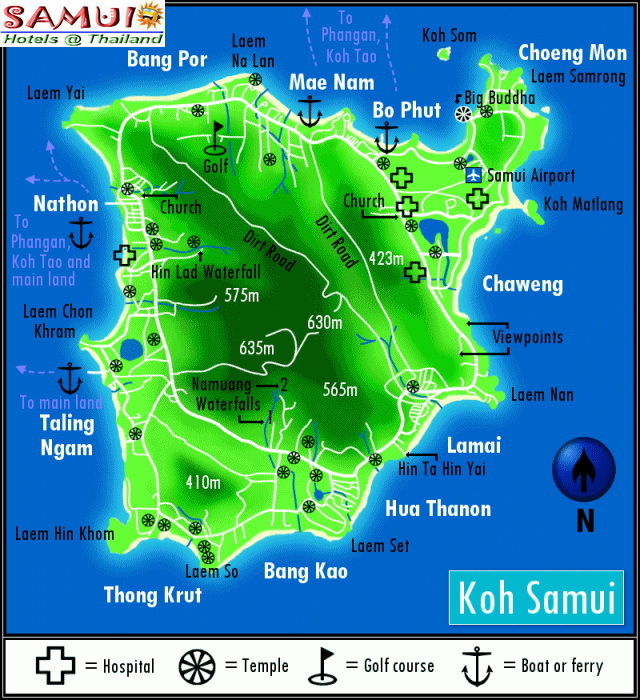 It is possible to travel to Koh Tao during the rainy season (May to October), though obviously, you should be prepared to run into showers and rainstorms. A boat departs from Ko Samui at 11 a.m. to Koh Tao via Koh Pha-ngan. The boat arrives Koh Tao at 1.30 p.m. The fare is 350 baht. Speedboats leave Maenam Pier on Ko Samui at 8 a.m. Travelling time is 1 ½ hours. The fare is 550 baht. Call Lomphrayah 0 7745 617 ot Songserm Travel 0 7742 0157 for details. A night boat departs from Surat Thani at 8 p.m.and arrives Koh Tao at 8 a.m. The fare is 250 baht.